Does your thermal label printer use near edge print technology? To achieve higher print speeds, the near edge print head is angled up to 45 degrees, with the heating elements located at the edge of the printhead. Therefore near edge ribbons must contain a release/primer layer, which allows the ink to quickly transfer to the substrate and creates a sharper image on the substrate. This unique ribbon chemistry limits ribbon selection to wax/resin or resin thermal transfer ribbon formulations. Manufacturers of near edge printers include, Avery Dennison, Bell Mark, Toshiba, Markem and Video Jet. 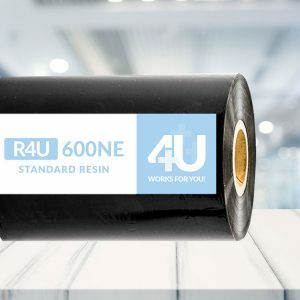 +R4U 600NE Standard Resin offers a superior performance for creating crisp, clean, sharp-looking barcodes for a wider variety of substrate materials. +W R4U 400 NE High Speed Wax-Resin barcode ribbon is a thermal transfer ribbon that is designed especially for the flexible packaging printing market where optimum printing performance at high speeds is required. +W R4U 410 NE Wax-Resin barcode ribbon is specifically designed to run on thermal transfer printers with near edge printheads, which provide consistent print quality, and clean dot edges for barcodes on a wide range of media. +WR4U 420 NE Super Wax-Resin barcode ribbon is a multi purpose wax/resin product and is very close to Toshiba’s most popular ribbon type for near edge printers performance wise (AG2). Its highly versatile performance fulfills the needs of most standard applications. +W R4U 430 NE Premium Wax-Resin barcode ribbon is a premium wax-resin ribbon that provides outstanding print quality in a variety of environmental conditions on substrates such as paper, many synthetic materials, a variety of coated paper, and matte synthetics.